How does Shakespeare make effective use of the soliloquy to increase the audience's understanding of character and plot? A soliloquy is a monologue where the character reveals their innermost information without addressing to a particular listener. It is the act of talking to yourself aloud and expressing the thought processes in ones mind. 'A soliloquy does not deal with minor matters, but concentrates on matters that are highly personal and revealing.' In a soliloquy, the character is usually alone on stage and temporarily away from other characters. In some cases, a spotlight is positioned directly onto the actor/actress in order to signify the importance of each and every word spoken by the character. It helps the audience to develop awareness of their personality and the events proceeding. Soliloquies were very common in Elizabethan drama, and intensely used by Williams Shakespeare. He made great use of soliloquies in his legendary plays and used them for a wide range of purposes. However, they serve two main functions and they are: to provide information that helps the audience follow the plot or describe events that have occurred offstage. They also reveal the intentions of characters so that the audience observes their actions. For example, in the well-known play Macbeth, Shakespeare uses several soliloquies in order to reveal the characters' major concerns. A soliloquy is most commonly used to reveal the deepest concerns or thoughts of the speaker, thus pointing out internal conflict. ...read more. In this speech, he uses longer sentences and shifts quickly between questions and answers, showing that his brain is leaping haphazardly from one thought to another. Also, this device illustrates Macbeth trying to reason it out with himself. An example of a soliloquy utilizing shorter sentences is that of Viola in Act 2 Scene 3 of Twelfth Night. In her speech, Viola uses shorter and clearer sentences to express her stress-free and calm behavior. The use of semi-colons, exclamation marks, question marks, commas and full-stops indicate her clear and organized thought processes. The soliloquy confirms that she is not worried about the happenings and shall leave it to fate and time. 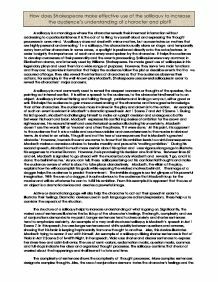 The complexity of sentences shows the complexity of thought processes. More complex sentences designate complex thoughts. Also, the use of conjunctions demonstrates the character's feelings and the flow of their thought processes. An example of a soliloquy acquiring conjunctions is that of Morocco in Act 2 Scene 7 of The Merchant of Venice. Towards the middle of his speech Morocco starts to develop his use of conjunctions. He uses conjunctions as he tries to think of more reasons to marry Portia. He assumes that all men desire Portia as he does, and so makes his mind. ...read more. In this speech Viola is quite calm about things and expresses no sense of anxiety. This is an example of emotive language because Viola accepts that women have weaknesses but leaves it all to fate and time. From her speech, the audience can discover her feelings at the time and understand her character in depth. 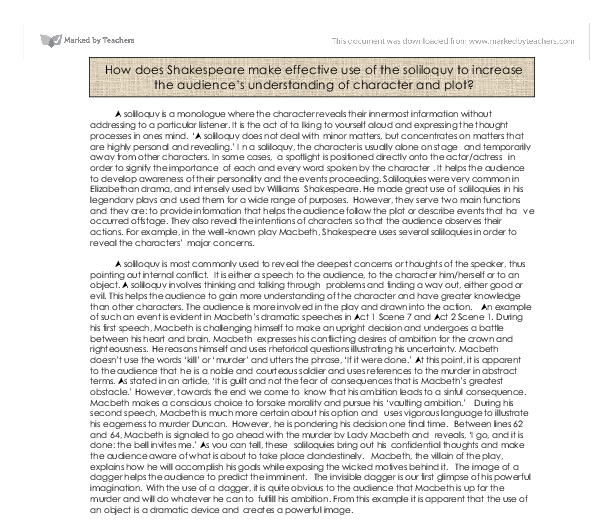 My conclusion is that Shakespeare uses several techniques and devices to increase the audience's understanding of the character and plot. He make effective use of the soliloquy by making it seem like reality, so that the audience can step into the shoes of the character and know them inside and out. Shakespeare includes actions, expressions, objects and several well-structured sentences to truly express the character. Shakespeare has done this because his characters are often not what they seem. The thoughts that we express in conversation with other people may be considerably different from our true ones. Similar applied to these characters of Shakespearian plays. Soliloquies seem realistic this way and bring out their true thoughts and feelings. This way, the audience comes to know their feelings in public compared to their feelings whilst they are alone. The audience become part of the play along these lines and experience the feelings and emotions alongside the character. A soliloquy also tells the audience of the plans that one of the characters is intending to put into action or one character's opinion about another. ...read more. desperately to hold on to his dignity by always holding his head up but by the end of the scene all his dignity has vanished as he is sat slumped in his chair with his head down and tears rolling down his cheeks. to become one big family, and unite with the people around them. It seems that all of the audience are one big family, and they need to come together to show how strongly they feel against this issue. If they want to come through it, they have to stick together. I particularly think that our last scene, with the fighting went exceptionally well. Also I think that we worked very well in rehearsals, which made it a lot easier on the day o final performance. Also I think that our scenes were very well planned, and set out. Finally, we come to true, 100% pure love. When Romeo meets Juliet, he knows that she's the one. Love changes people. Within this Romeo became a more passionate, enthusiastic person and Juliet became more independent. Most importantly, love lasts through hardships. ultimately accentuate his facial expressions and physical movement as well as keep the audience entertained with the words themselves. The actor producing an ostentatious manner whilst walking across stage that shows pomposity and pretentiousness can develop more irony. that the audience would also suspect that there is a chance that no money is coming for Juno, who is heavily in debt. By giving the audience information that Juno does not know, O'Casey prompts them to sympathise for Juno. But I'm like everybody else now. I'm practical now. You made me practical." He blames his mother for this but she doesn't understand, claiming that he has to be practical. Chris's ideals have been spoilt by his and his father's guilt.